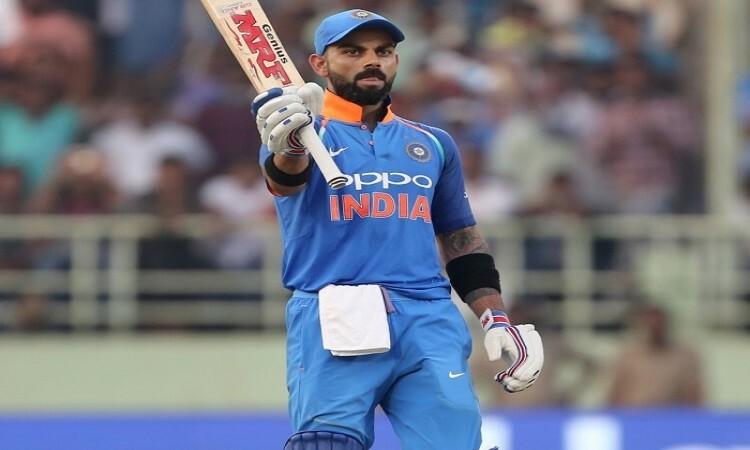 Visakhapatnam, Oct 24 (CRICKETNMORE): India rode on skipper Virat Kohli's second successive century and a brilliant half century from new No.4 Ambati Rayudu to post a staggering 321/6 against the West Indies in the second One-day International at the Dr. Y.S. Rajasekhara Reddy ACA-VDCA Cricket Stadium here on Wednesday. Opting to bat on a placid track, Kohli came up with yet another authoritative century, his 37th in ODIs, to anchor the hosts to a comfortable position after the early dismissal of the openers. In the process, the 29-year-old skipper also reached a personal milestone of becoming the fastest batsman to reach 10,000 ODI runs. Coming into the match, 81 runs shy of the 10,000-run mark, Kohli got to the landmark in style, before racing to his sixth century of 2018 in a mere 106 balls. With the knock, Kohli also completed 1000 ODI runs in the calendar year. Immediately after smashing the century, the Delhi batsman changed gears by depositing debutant Obed McCoy for two massive sixes before dispatching Kemar Roach for a six and two boundaries, to single-handedly take India past the 300-run mark. Kohli, eventually ended on an unbeaten 157 off 129 deliveries, laced with 13 fours and four sixes. Earlier, after the early departure of openers Rohit Sharma (4) and Shikhar Dhawan (29), Kohli and Rayudu (73 off 80 balls; 4X8) dug the hosts out of trouble with a 139-run fourth wicket stand. The 33-year-old Rayudu, who was recently anointed India's No.4, grabbed the opportunity with both hands, matching his skipper shot for shot before reaching his ninth ODI fifty with a boundary off McCoy. With the hosts going great guns at 179/1, off-spinner Ashley Nurse managed to break the partnership with the wicket of Rayudu before former skipper Mahendra Singh Dhoni (20 off 25; 6X1) joined Kohli for a brief 43-run fifth wicket stand. Promoted up the order, Dhoni managed to show glimpses of his vintage self before being castled by McCoy. Thereafter, Rishabh Pant (17 off 13; 4X2) and Ravindra Jadeja (13 off 14) gave company to a rampaging Kohli, who blew away the West Indian attack from one end to help India to the massive score. Brief Scores: India 321/6 (Virat Kohli 157 not out, Ambati Rayudu 73, Shikhar Dhawan 29; Ashley Nurse 2/46, Obed McCoy 2/71) vs West Indies.